While the IEA got a lot of coverage for its World Energy Outlook 2018 (WEO 18), there might be a little snippet that got way underappreciated. 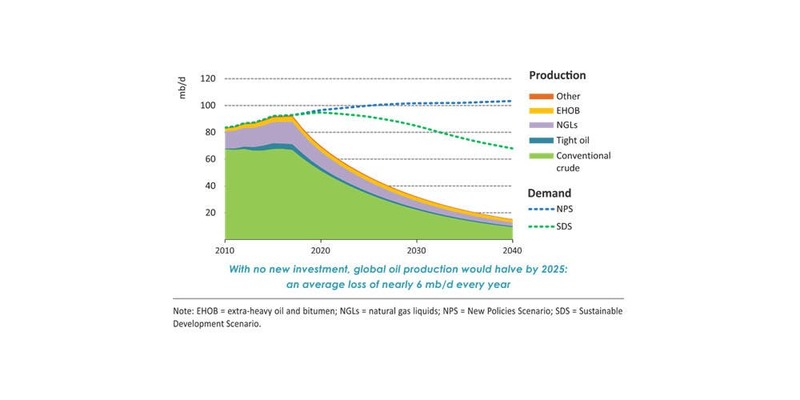 It is clear to see that Peak Oil will be hit well before 2020, while demand keeps on rising, unless the world’s Oil Majors and State Owned Oil Companies would massively invest in new exploration, according to the IEA. It means that a collapse of oil supply to half of its current size within only six years simply cannot be compensated by new oil findings and certainly not by unconventional oil sources like oil sands and fracking. That the Oil Majors did not pick up with new oil exploration after the oil price rose again to $100 per barrel in the years after 2008 is another sign that the world is already “overexplored,” as geologists put it. Instead the Oil Majors concentrated on a stock buyback, knowing full well that further exploration would be a waste of money while they are sitting on oil that will become very valuable even though the amount of oil they will extract will decline significantly. In summary, the Oil Majors and State Owned Oil Companies (in this field notably the Initial Public Offering (IPO) of Saudi-Aramco, the world’s biggest oil company, has been scrubbed) are waiting for an oil price bonanza to happen, while the IEA is very concerned about future oil supply. While the IEA has no credibility left when it comes to renewables (see following graph), because its forecasts historically have all been absurdly wrong, the IEA should possess some knowledge in the oil business and especially concerning the decline rates of existing conventional fields, which have been studied in depths for decades. Notably the Peak Oil graph from the IEA (first graph in this article) has been unearthed by the Association of Study of Peak Oil and Gas (ASPO), which as an organization has itself published multiple studies on Peak Oil. While ASPO has put Peak Oil sooner than the IEA, in its latest study already at 2011 for conventional crude, it is remarkable that the IEA refuted this claim back then with the statement that Peak Oil would not be reached before 2020. Well, it surely looks like they corrected that statement for themselves now. So what does that mean for investors in oil and the world economy? Surely there could a handsome profit be made by riding the coming oil shortages, but one has to keep in mind that while the oil price may go through the roof, the barrels that can be sold also shrink fast and drastically. So there remains the question of how high the profits of the Oil Majors will rise and how much will this be appreciated by the stock price for these clearly dying companies. Furthermore, with these rapid stock swings, you compete with banking supercomputers that act in a millisecond timeframe, so you would have to be alert night and day for the point when the crash will come because of the world economy not being able to take the oil price anymore. As a conservative long term investor, this can only mean to get out of these stocks as soon as possible, while risk-loving investors can try to make a quick buck on the coming stock volatility, with the world economy crashing a couple of times due to ongoing undersupply in oil. For the climate, this is excellent news, because the adoption of electric vehicles and clean transport in general will get a major boost and surely blow all current predictions out of the water. As an investor this is imho, where your money should be. About the author: Dr. Harry Brinkmann got a Ph. D. in Physics in the working group “Applied Physics” from the Justus-Liebig-University in Gießen. In his free time he is contributing to working groups of Bündnis90/Die Grünen such as Bundesarbeitsgemeinschaft Energie (Federal working group energy) and likes arguing with people online over energy solutions and a sustainable future. Based in Berlin, he also writes and publishes German novels.